To be honest, we weren’t particularly looking forward to the ‘tour’ to the top. But bloody hell this was the best tour I’ve ever been on. Our tour guide Alan (half Maori, half Scottish) was the perfect person to drive us to the top, not only did he grow up in the northernmost settlement here, but he was also the last person to man the lighthouse at Cape Reinga before they converted it to solar power and presumably fully automated in 2000. He was a very funny bloke, seemed to know everything about the Far North, even what all the farms were planting or how many head of livestock everyone had. 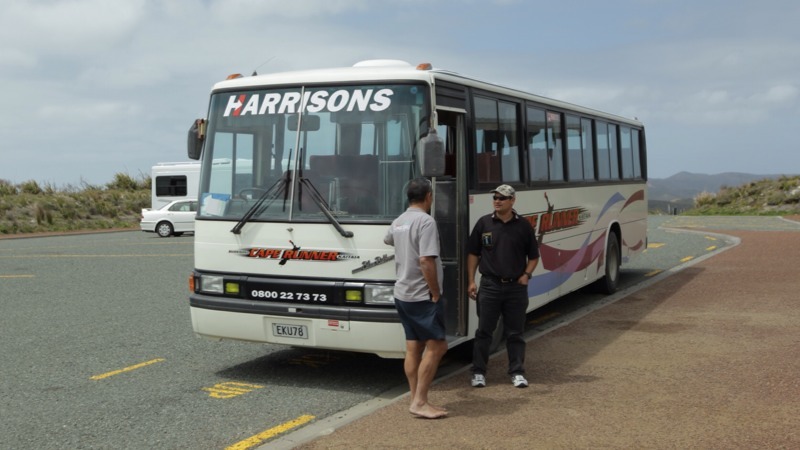 We’d decided to try and find a camp before we hit Paihia instead of blowing cash on a motel. And it turned out to be an awesome decision as it lead us to this phenomenal spot. I’m sat typing this in front of a wide gushing waterfall, surrounded by forest, giant date palms, and blue sky. And yet I can still grab a shower if I want. Perfect! I awoke in the night and stepped out to see spectacular starry sky set against the subtly illuminated falls. Beautiful. Olga and Andre the owners are really lovely down to earth characters. It’s a must-stay if you’re in town! :D Its lush. ( Thinking about trying my fishing rod in a minute… ). Found this amazingly situated campsite, right on the edge of the water overlooking the Haruru Falls. Kind of found it by accident (we were a bit off trail), but once we spotted it from across the river we made a beeline straight for it. It was bonfire night last night and German boys camped next to us made a timely bonfire for us in the evening :) Not sure if they knew anything about bonfire night though, I think they were just pyromaniacs! The fire was fueled mainly by old kitchen cabinets, god knows where they found them..? A snap decision to follow a road to the sea for a lunch break brought us to this beautiful little cove, with turquoise waters lapping the sand and picnic bench – ripe for cheese and cracker action, and a snooze in the warm sun. Sweet! I took these revelations with an extremely large pinch of salt of course, (!). Some things the people you meet allude to can take us by surprise, to say the least! But in general the more of New Zealand we explore, the more we begin to glimpse some deep rooted feelings and very complex relationships between all the peoples of this beautiful country. It’s going to be a hard one to fully understand. After a day of discovering some awesome beaches we ended up in the DOC ( Department of Conservation ) campground in the Mimiwhangata Coastal Reserve. After an epic, hot and sweaty 13 mile day we were so thankful when fellow campers Aiden and Helen popped over to introduce themselves bringing with them cold beers! Wuhoo! What awesome lovely people :D We salute you!